Specially designed for counter-insurgency (COIN) operations from the outset, the versatile OV-10 Bronco served the US military with distinction from the Vietnam War to the first Gulf War; and many examples are still serving around the world. 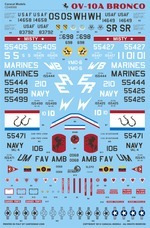 Our first decal sheet for the Bronco provides a wide variety of marking options for this important combat aircraft. Full stencilling and national insignia to build any one of the options are included. This sheet was professionally screen printed by Cartograf in Italy. SOLD OUT! We sold out our entire print run of this very popular sheet. Please check our resellers (such as Sprue Brothers in the US, and Hannants in the UK) to check if they have any in stock.